I’m a longtime fan of Allison Winn Scotch as a person (her blog is a treasure trove of good advice for writers, and she was LOVELY and generous when my first book came out, writing a post that made me feel so good I still remember it) and as a writer (I’ve loved & raved about each of her novels), so when I got the chance to review an advanced copy of her latest, I jumped at it. In her notable, unique style, THE THEORY OF OPPOSITES takes on the question, What happens when you think you have it all, and then suddenly it’s taken away? My favorite part of the book is the friendship between Willa and Vanessa, who pushes her (relentlessly but with great humor) out of her comfort zone. It’s a reminder of how important friends are as we find our way. I love how Allison writes books I can’t stop thinking about, and how she takes her characters through life’s thorny situations in a way that is both inspiring and entertaining. Five stars. A captivating page turner. 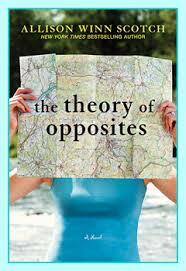 This entry was posted in Book Recommendations and tagged Allison Winn Scotch, Book Reviews, Reading, The Theory of Opposites on November 3, 2013 by Trish Ryan. Coming Clean: A Memoir by Kimberly Rae Miller. Fascinating story of growing up as the child of two hoarders. She paints her parents as vivid, multi-dimensional characters. A page turner AND a great reminder that despite a desolate, imperfect childhood, things can turn out okay. Chasing Francis: A Pilgrim’s Tale by Ian Morgan Cron. A burnt out pastor has his faith revived as he follows the path of Saint Francis. Not the type of book I’m drawn to, which made it rather surprising that I enjoyed it so much. The Buy Side: A Wall Street Trader’s Tale of Spectacular Excess by Turney Duff. A memoir from a high school friend who went on to much bigger & wilder things after he left our small town in Maine. Great writing, and an interesting story of building a life and then tearing it down…and then building back up again. I’ve recommended this book to friends and family members from all demographics, and all have loved it. Highly recommend. Finding Spoons: A Love Story on Two Wheels by Victoria Merriman. I got to read this in draft form and loved it then, so it’s especially fun to see the finished book. A fun and crazy-inspiring memoir by a friend who traveled the country, BY HERSELF, on a bike. She camped in people’s YARDS, and on giant bales of cotton, among other places. Just incredible. You’ll love it. The Theory of Opposites: A Novel by Allison Winn Scotch. Confession: I’ve already read this & it’s FANTASTIC. I’ll do a full blog on it closer to it’s pub date in November, but if you want a treat to look forward to, go ahead and pre-order. This entry was posted in Book Recommendations and tagged Allison Winn Scotch, Dani Shapiro, ian michael cron, kimberly rae miller, Positive psychology, Reading, Turney Duff, victoria merriman on October 1, 2013 by Trish Ryan.